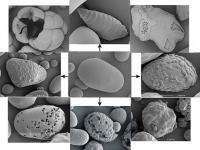 By equipping potatoes with genes involved in starch synthesis in other organisms, potatoes get the ability to produce new types of starch granules. Centre: regular starch granule of potato, around it: new types of granules. It is possible to breed potatoes in such a way that they produce new types of starch for use as a new and improved plant-based raw material in the construction, paper, glue, fodder and food industries. These results are described in Xingfeng Huangs PhD thesis, which he will defend on 29 November 2010 to obtain his doctoral degree at Wageningen University. Using genetic modification, Huang managed to develop potatoes with larger starch granules, a higher capacity to retain water after several cycles of freeze/thaw (interesting, fro example, with frozen meals) and have a stronger capacity to form gels (useful when making sauces). The cells of potato tubers contain starch in the form of starch granules. The plant produces these granules because enzymes adhere to the outside of the granule, building up the starch granule. The enzymes adhere to the granules because a specific part of the enzyme, the so-called Starch Binding Domain, is able to recognise starch. The way the granule is built up depends on the activity of the rest of the enzyme. The cooperation between the enzymes involved in starch biosynthesis affects the shape and size of the starch granules, as well as other starch properties such as the ability to bind water, as required when making sauces and soups. There are bacteria that contain enzymes involved in the breakdown of starch and these enzymes also have a Starch Binding Domain. They often have a slightly different function than the enzymes already present in the potato. If potatoes were able to produce these enzymes, it would probably result in starch granules with new characteristics. This could make the potato an even better source for plant-based raw materials; materials that are sustainably produced in plants. Via genetic modification, Huang introduced genes in the potato which code for proteins that combine a Starch Binding Domain with different bacterial enzymes involved in starch modification. Huang discovered that the new fusion enzymes often caused the potato plants to produce starch granules with an entirely different appearance than the granules usually found in potato cells. When Huang used the gene for the amylosucrase enzyme of the Neisseria polysaccharea bacteria, it also changed other important characteristics of the starch granules. The granules were on average twice as large, for instance, and the starch was more capable of binding fluids. This means that smaller amounts of starch can produce the same viscosity in, for example, sauces and desserts. It was also shown that the new starch granules were better at retaining water, which is highly relevant to frozen food products. When the starch in these products discharges too much water, they can often no longer be used once they have been defrosted. Huangs research shows that it is indeed possible to develop potatoes that produce new, better sustainable raw materials. Potato starch is already being used in the construction paper, glue, fodder and food industries. New types of starch could benefit these and other possible applications.